Kyushu University , abbreviated to Kyudai, is a Japanese national university located in Fukuoka, Kyushu. It is the 4th oldest university in Japan and one of the former Imperial Universities. It is considered one of the most prestigious universities in Japan. The history of Kyushu University can be traced by medical schools of the feudal domains built in 1867, and is the largest public university in Kyushu. There are 2,089 foreign students (as of 2016) enrolled in the University. It was chosen for the Global 30 university program, and has been selected to the top 13 global university project. Kyushu University does not have an official school song, instead it has one cheering song and three student songs including Matssubara-ni, with lyrics by Yoshifumi Akiyama. The University’s logo features a background of pine needles inset with an older iterance of the kanji for “university”. The logo was officially established in 2004, but was originally proposed by student Sou Yoshihide in the mid 20th century, and was used then on from 1950. There have also been alternatives designs, such as those featuring the Japanese KU or Q, for Kyushu instead of “university”. On March 3, prior to the incorporation of national universities in April 2004, the Committee of Public Relations agreed on a new university logo and color that symbolize Kyushu University under the new structure. In July 3, 2009, Kyushu University was chosen as one of thirteen venues for the“Global 30 (G30) Project,”planned and funded by Japan’s Ministry of Education, Culture, Sports, Science and Technology (MEXT). The major aim of the project is to further promote the globalization of Japanese higher education by assisting a select number of universities through the prioritized allocation of grants. The recipient schools are expected, among other things, to build and improve a system whereby overseas students may study and engage in research with minimal cultural and linguistic barriers. This more focused approach to budget allocation is also expected to help realize the government’s public commitment to accommodate more than 300,000 international students on Japanese campuses by 2020. In February 2010, the University opened an all purpose office in Cairo, Egypt, bringing the number of its overseas offices to 13 . Although the Cairo Office is managed by Kyushu University, all other Japanese colleges and universities can have access to its services and facilities when trying to recruit students or promote academic projects in Egypt. By implementing these measures, Kyushu University is expecting to raise the number of its international students to 3,900 within a decade, a 300% increase over the current number. By the time the five-year grant terminates, the University will also have laid the foundation for a new interdisciplinary department (tentatively called the “International School of Arts and Sciences”), which is expected to launch by 2020. Kyushu University is one of the seven former Imperial Universities created in the Meiji period. The university is the largest research university in the Kyushu region with research centers in eleven different academic faculties, including the humanities, social sciences, medicine, and science. 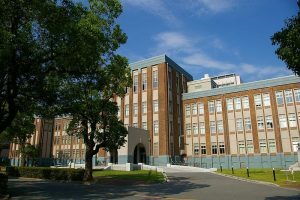 Kyushu University Hospital is affiliated with the Faculty of Medical Sciences and the Faculty of Dental Science. 1867 The Kuroda Clan establishes an institution for Western medicine (Sanseikan) for the children of the lord and their retainers. The roots of present-day Kyushu University Hospital can be traced back to the clinic affiliated with that school. 1879 In the beginning of the Meiji period the clinic becomes an affiliated hospital of Fukuoka Prefectural Medical School. 1903 Fukuoka Medical College, a branch school of Kyoto Imperial University is established, and the hospital becomes affiliated with that school. 1911 Kyushu Imperial University is established in Fukuoka, and this hospital becomes affiliated with the university’s Faculty of Medicine. 1931 The Research Institute of Balneotherapeutics is established in Beppu, Oita Prefecture. 1947 Following the university reform that took place after World War II, the hospital’s name was changed to the Kyushu University Faculty of Medical Sciences Affiliated Hospital. Fifteen departments, including a dental department, were established. 1967 The Faculty of Dental Science becomes an independent facility. The Faculty of Dental Science Affiliated Hospital opens. 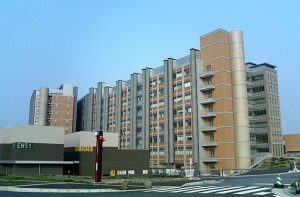 2003 The three hospitals affiliated with Faculty of Medical Sciences, Faculty of Dental Science and Medical Institute of Bioregulation merge to form Kyushu University Hospital. 2009 Plans for the construction of a new hospital, which began in 2000, are completed. The new hospital consists of a South Ward, North Ward, West Ward and Outpatient Ward.